See more from OnScript’s own site and get your free evaluation copy. Alternatively, see why Guy Recommends OnScript. I actually use OnScript myself. 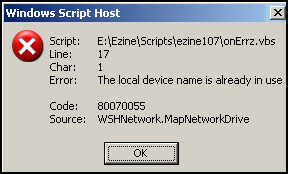 The problem that I have with Notepad is that it’s not easy to see the line numbers, so when I get the inevitable WSH Error message I cannot easily find the line to which the message refers. Naturally I can work out where Line: 17 is located with notepad, but it takes time. Moreover, my brain wants to concentrate on the high level task of solving the problem not the low level task of counting line numbers. OnScript’s color coding prevents me from making silly errors by placing comments in green, verbs in blue and strings in dark red. Color coding and line numbers may sound trivial, but these are my killer reason for buying a script editor. However, a top quality script editor such as OnScript has many more features. Not only will OnScript help with troubleshooting, but also it will give you extra insights as to how VBScript works. After you select a command you get a little drop down menu that show you what commands are available. OnScript also has a library of VBScript commands. As a practical point, I am increasingly impressed with tabs so that you can gain quick access to half a dozen files that I am working on. When you run your scripts in the OnScript interface you get an output box so that you can see if it executed properly, or peruse any error messages. There is no equivalent with notepad. It all comes down to whether you believe time saved means money saved. OnScript will save you time, both troubleshooting individual scripts and learning VBScript. Finally, no online software gets the ‘Guy Seal of Approval’, unless you get a trial offer and, or a money back guarantee.